I wasn't going to post this week with all the crazy house moving stuff going on around me but I really wanted to share these little guys with you. I wasn't even going to bake last weekend, but I had some leftover egg whites in the fridge and I decided to do one last batch of macarons in my current kitchen of old time's sake. I've done some Christmas-related macarons (snow men, presents) and so many animal macarons (koalas, cats, pigs, chicks, bunnies), so here's something that's a little bit of both. 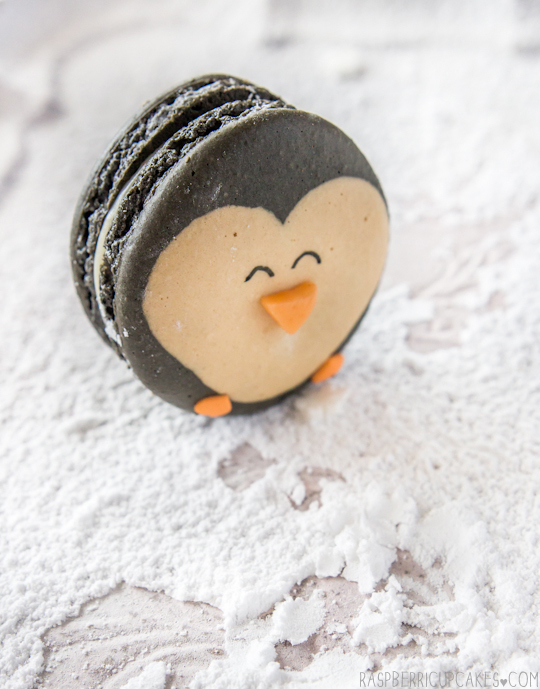 Penguin macarons filled with Eggnog Ganache. 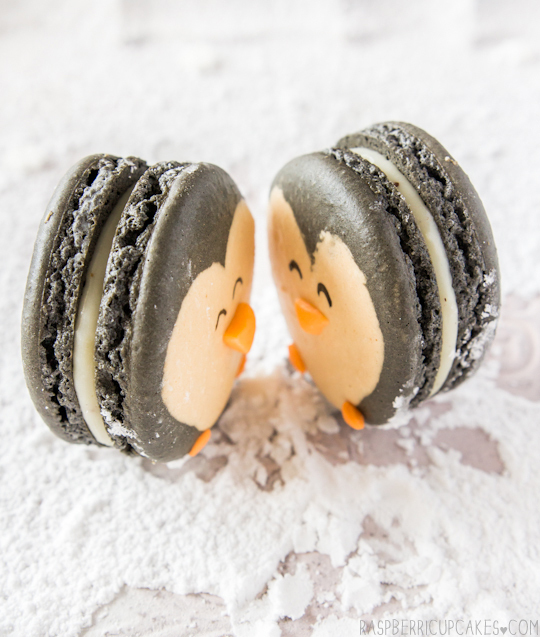 Don't ask me why there's a pair of penguin macarons in a tiny bed. I was having a weird day. I guess I thought they looked cold after playing in the fake snow? I don't know. And I'm aware they don't look much like penguins, but they're still cute. 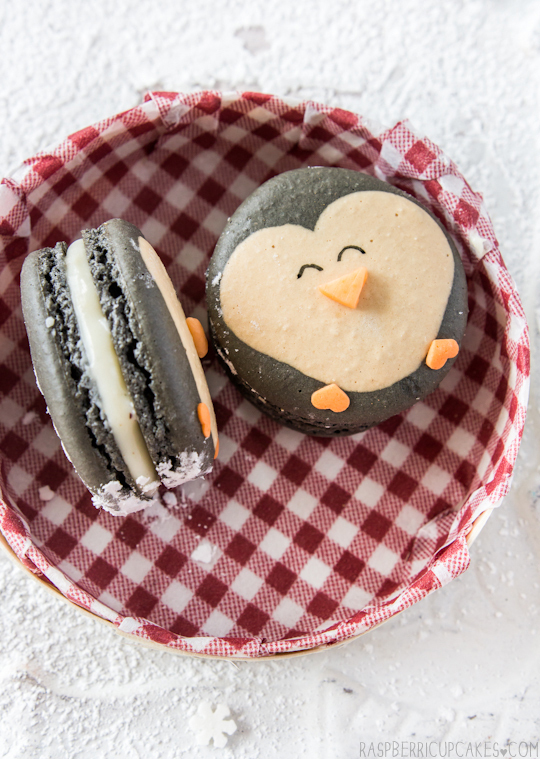 I'd like to believe that if a penguin macaron was playing around in fake snow that he'd be making snow angels with his invisible flippers. 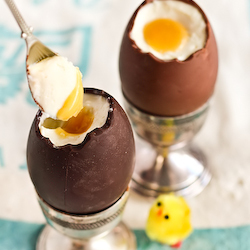 The eggnog flavoured ganache is made with white chocolate ganache, eggnog and plenty of nutmeg. It's pretty delicious. You can always skip the eggnog part if you're not a fan of it but to be honest it's not that different from a regular white chocolate ganache. Their little beaks are made from bits of chewy Starbursts. Anyway that's it from me, I just wanted to share something fun with you. This year I get to make the trifle for Christmas lunch, hopefully I can pull something good together even though I'm right in the middle of moving house and may possibly be without a working oven. Merry Christmas everyone! Add meringue to your dry mixture and mix together with a spatula, quickly at first to break down the bubbles in the egg white (you really want to beat all the large bubbles out of the mixture, which is easily done by smearing the mixture on the bottom and side of the bowl with your spatula), then mix carefully as the dry mixture becomes incorporated and it starts to become shiny again. Place 2/3rds of the mixture in a separate bowl and add black food colouring. 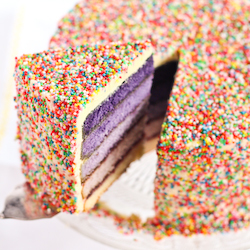 Take care not to overmix, the mixture should flow like lava and a streak of mixture spread over the surface of the rest of the mixture should disappear after about 30 seconds. Place black mixture in a piping bag with a 1cm round piping tip. Pipe ovals about 2.5cm x 3cm wide on your prepared trays, leaving about 3cm space around each one (try and make half of them a few mm bigger, these will be the backs of the penguins). Tap baking sheets carefully and firmly on the benchtop a couple times to remove any large bubbles. Place white mixture in a piping bag with a 1cm round piping tip. Very gently pipe a small V-shape in the middle of half of the piped macarons (like this photo), then tap sheets again to remove any bubbles. 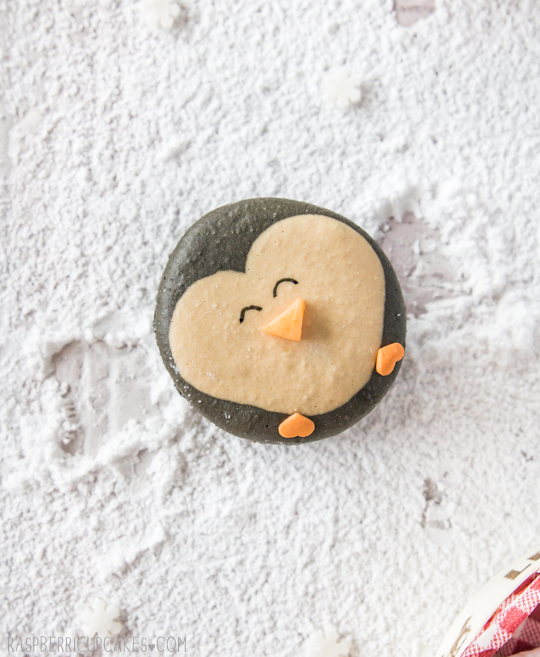 Carefully add two heart-shaped sprinkles to the bottom of the black and white shells for the penguin feet Leave to dry for about 60 mins, until when you press the surface of one gently it does not break/stick to your finger. This will help prevent any cracking and help the feet to form on the macs. Preheat your oven to 130-150°C (265-300°F), depending on your oven (fan-forced ovens may need to be set as low as 100°C, it really depends) . You can place the sheet of piped shells on top of an upside-down roasting tray or another baking tray, for better heat distribution. Bake for 20-25 minutes, depending on the size of your shells. Carefully test if the base of the shell is ready by gently lifting one and if it’s still soft and sticking to the baking paper, then it needs to bake for a few minutes longer. Remove from the oven and cool on the tray for a few minutes, then gently remove from the sheet and place on a wire rack to cool. Use an edible ink pen or a skewer dipped into liquid food colouring to draw on eyes. Place chopped chocolate and nutmeg in a bowl and set aside. Heat eggnog in a small saucepan on medium-low heat until it just comes to the boil and then pour over the chocolate. 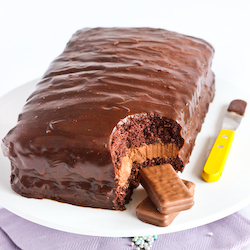 Leave for about 3 minutes to allow chocolate to melt. Use a whisk to combine mixture until it is smooth. Chill, whisking it every 5 minutes to ensure it stays smooth, until the mixture thickens but is still pipable. Place in a small piping bag (ziplock bags with a corner snipped off are handy for this), pipe on one of the black and white shells and sandwich with a black shell. Repeat with remaining shells. Chill macarons in an airtight container overnight to allow flavour to mature. Serve at room temperature. 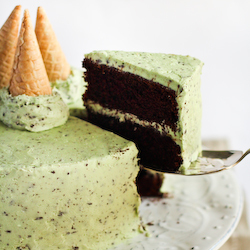 Check out all my past Christmas recipes! Your Macarons look so quite! I have troubles making the normal one, I can't even imagine at the moment how mine would look if I would try to make some. These are so cute I can't quite take the adorableness! If only I could make macaroons! Wow !! They look inspirational !! Ahh love this! They are freaking rocking my world. Too cute <3 I love them!!! I want to get to the point where I'm mid-house move and can whip up some adorable macarons with a few spare egg whites. I'm so envious! :) I love how cute these look. So sweet and you're so talented to think of them and be able to make them! So cute et perfectly made ! oh my goodness, these are adorable! I am terrified of making even plain macarons, but you may have just inspired me! This is hands down the cutest thing I've seen all day! 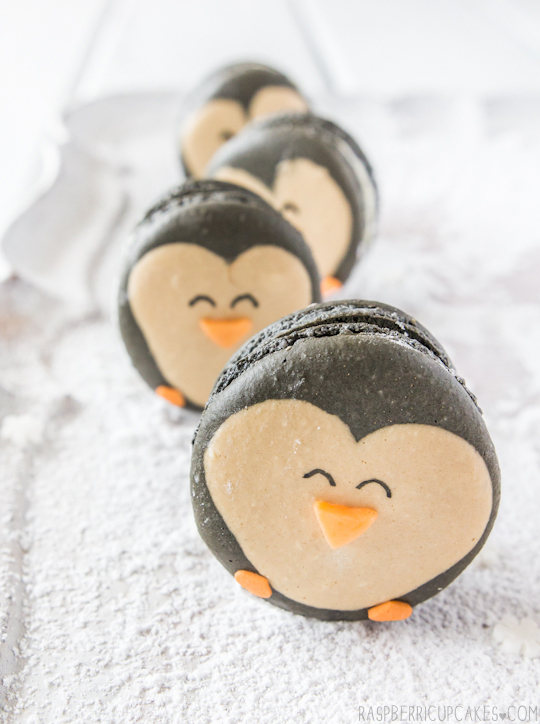 Oh my god, these must be the cutest macarons I've ever seen. 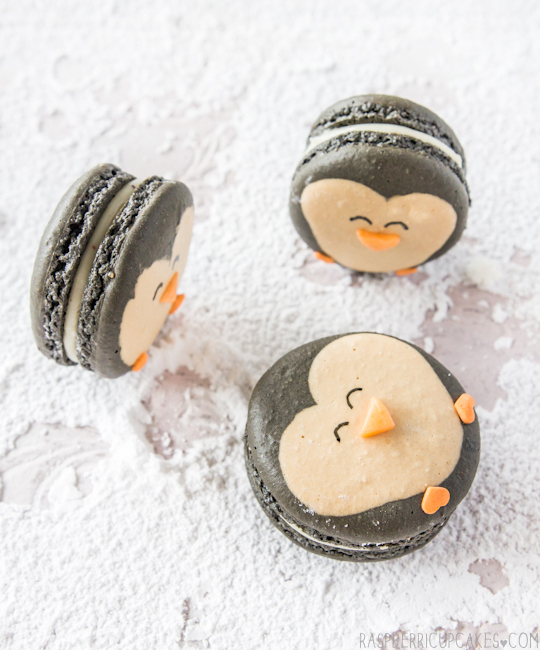 All my attempts at baking macarons have been disasterous so far and you're coming along with two-colored, penguin-styled ones. I am mindblown. holy crap these are amazing! 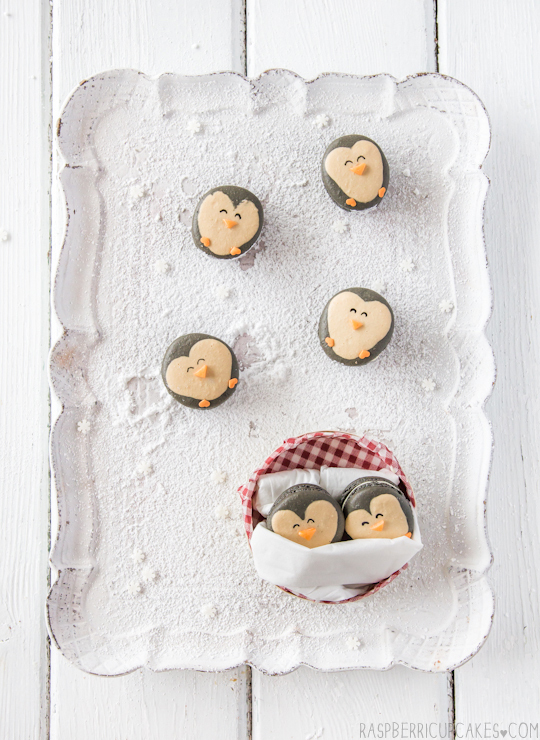 I don't think I would be able to eat them, they're just too cute! these are PERFECT! you're always my macaron inspiration... your recipes are amazing. I am fallen in love....your penguins are soooo cute!!! These are so cute. You really are so talented. Just looking at them will make someone smile! These are SO cute! I love the cute faces, and the photo with them in a bed! Too cute. These are way too cute...! Happy New Year! This is too cute! You're very talented! Oh wowwww! These are amazing! Terrific job Steph!